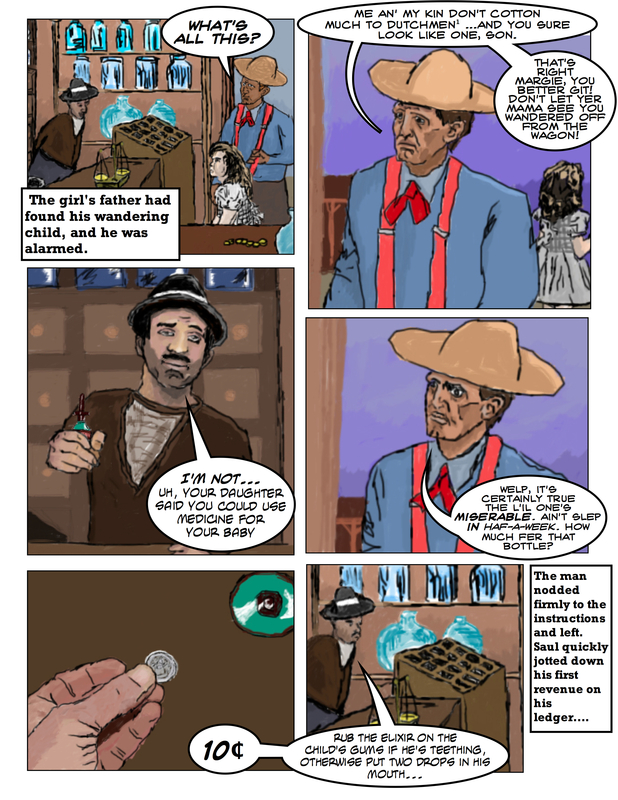 Panel 3: The frame centers on Saul, still in the same black hat and brown coat, who we see extending the small and fragile glass Paregoric dropper in a closed but offering fist from behind his counter, and answering the man’s “Dutchmen” comment as best he could, saying: “I’m not… uh, your daughter said you could use medicine for your baby…” Behind Saul stood the drawers and shelves which held his most valuable medicines. Panel 5: “10¢” Saul answered. Ceiling view, looking straight down at Saul’s counter, where the small Paregoric bottle sits. The farmer’s wrist and hand extend across to the counter, in his offering thumb and forefinger laid a Seated Liberty dime, one of the few widespread federal coins in an era of state and local currency. 1. “‘Dutchmen’ was a popular (and somewhat unflattering) nickname for German Americans.” Siddali, Silvana. Missouri’s War: The Civil War in Documents. Athens, OH, USA: Ohio University Press, 2009. This comic book takes place in 1861, when anti-German sentiment was running high. They self-identified as “Deutsch” which became “Dutch” to their detractors. St. Louis was a focal point of German immigration in the mid-19th century (that’s why Anheuser-Busch and the brewers that bring you Budweiser are in St. Louis even today) and the flood of immigration irritated “old-stock” Missourians. These sentiments exploded into outright hatred when Missouri Germans overwhelmingly supported the anti-slavery Republicans.